The night train brought us to Gävle station at 6:49 in the morning, where we were hurriedly roused to lug our suitcases through the snow and up and down the station stairs, half asleep. For many of us, it was our first time riding or sleeping on a train. I had never taken a night train by coach before, and I found it surprising that they kept most of the lights on even at night, since busses and planes just use aisle lights. The lights and seats made it very difficult to fall asleep, and I was grateful for the few hours of sleep I managed to get. After using up most of our food provisions the night before, we were grateful for the convenience store where we purchased sandwiches and juice for breakfast, before catching a commuter train to Falun. We could tell we had travelled much farther south, because it was light out at 8:30 in the morning (in Jokkmokk, it would still be dark out). From Falun, we caught a bus, where most of us slept through the hour and a half ride to Mora. Leila says the night train is ideal because you get free lodging, but between sleeping in coach and sleeping on a bus, I preferred the bus because it’s quieter, darker, and more comfortable. 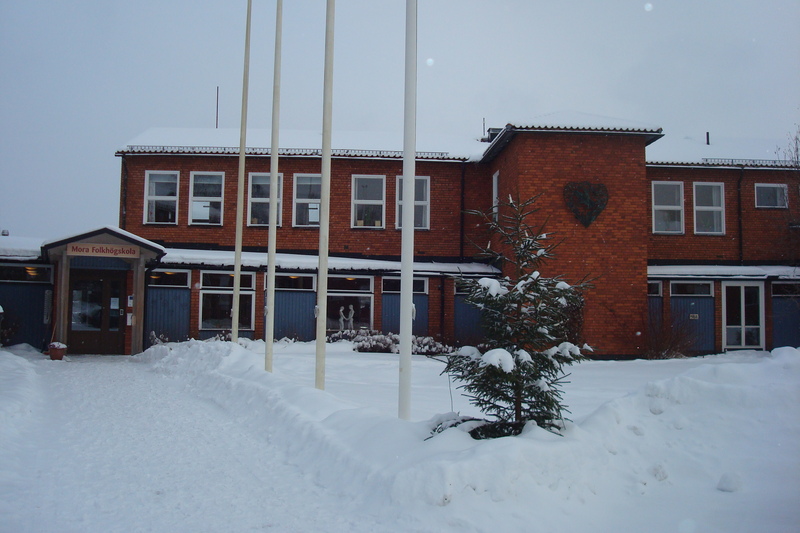 At 10, we met our hosts and professors at the Folkhögskola (folk high school), Anna and Lennart, who will be teaching the course People and Politics. 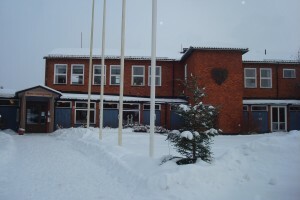 This is also a folk high school like Samernas, except for Swedish culture. 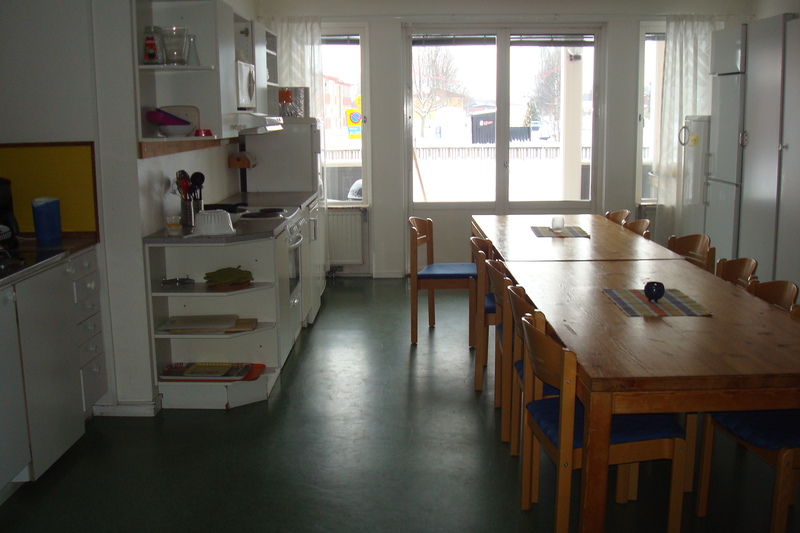 Many students learn living skills such as cooking and crafts; since this is a rural area, the idea is to teach students to live cheaper by being more self-sufficient. In the homelike student kitchen, they welcomed us with a wonderful lunch of spaghetti with fresh Parmesan, salad with a variety of veggies, chocolate, coffee and tea. Anna talked to us about what we would see and do here in Mora. This is the province of Dalarna, home of the famous wooden Dala horses and the center of Swedish culture, just as Jokkmokk and Samernas are the Swedish center of Sami culture. Today, the students had a “fresh air day” to go skiing, skating, or ice fishing. Soon we will be preparing for the Vasaloppet (like the Birkebeiner). I am looking forward to cross-country skiing in the powdery snow and perfect temperature. Friday morning before the sportlov, or break, the students will make beds for the skiers, who will be sleeping in classrooms. After lunch, we continued to unpack relaxed in our rooms, still exhausted from our long train trip. I went exploring around the school a little bit. Here, we are staying in very nice dorms, with a spacious kitchen, large living room with wii rockband equipment. The rooms themselves are comprised of two bedroom clusters with a shared mudroom and bathroom. It’s great to finally have our own space now. We also get free meals on weekdays, plus two fikas (coffee breaks) in between. I don’t know how I’ll get used to drinking so much coffee or eating supper at 4:30 in the afternoon. 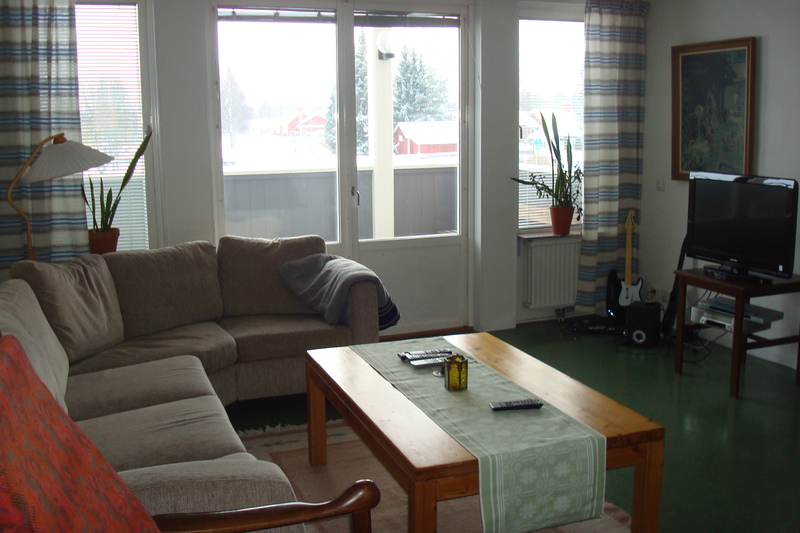 We have lots of opportunities here: handcrafting, choir, and cross-country skiing. Stairs and elevators are different here. Elevators only have one door that opens with a handle. All of the places we’ve stayed at, and many other buildings have spiral staircases that wrap around a pole, with wedge-shaped steps, and only one handrail. There is only enough room to walk on one side of the staircase, which is dangerous if you’re trying to pass someone or carry something, a lesson I learned the hard way. There is still a lot of snow here, especially since they don’t salt the streets or sidewalks, but after the bitter cold during the winter market, it feels balmy here. For the first time since we arrived in Sweden, I can take off my gloves to unlock the front door without my hands freezing. That evening, some students went to the weight room or relaxed some more. Jens, Cami, Kallie, Erik, and I went to the Mora women’s innebandy, or floorball match. We walked there, which was a challenge because a lot of the roads are narrow and don’t have sidewalks, so in many places, we were trekking through calf-deep snow in ditches, on railroad tracks, and through the woods. The game was Mora versus Umeå, who defeated them 7-1 last year. We sat on hard, wooden bleachers in a corner where it was hard to see, but I thought it was better than the stands that were parallel to the arena, where spectators often had to duck when the ball flew out and chase after it to throw it back in. The arena itself was shaped like a hockey arena with calf-high sideboards that moved around when players were checked into them. Arena staff often had to move them back into place and the referees would have to jump out of them as players approached the wall. The players’ uniforms looked like soccer uniforms without shinguards, but the goalkeepers uniforms looked a lot like hockey goalies’ uniforms. They didn’t wear gloves and had to quickly grab the ball amidst the players’ sticks. One brave goalie left her team’s goal open to crawl behind it and grab the ball. Loud choruses of “Nej!” (“No!”) rose from the fans on a missed shot, but I heard the English commands “Mark up!” and “Sub!” (We found out later this was because a couple of the Mora players were from Switzerland). Floorball matches are one hour long, played in 20 minute blocs. In the first third of the match, Mora led 4-1, but by the end of the last third, they were tied with Umeå. In overtime, Mora sent a flying shot into the net, securing their victory at 5-4. After the match, we chatted with Lennart and met one of his sons, who took a group picture of us. After getting back to our dorms, we decided that the struggle through the snow was well worth seeing a professional floorball game and getting a workout and sightseeing in the deal. Now that the Winter Market is over, I’m looking forward to classes again, but our week of sleeping in is over and we’re back to being up and at ’em by 8:15. Good to see Andersbo again. My wife, our two kids and I lived there for a year when the Mora-Gustavus exchange was in its infancy. Enjoy your stay in Mora and greet Anna and Lennart from me.